Anti-piracy group BREIN is caught up in a huge copyright scandal in the Netherlands. A musician who composed a track for use at a local film festival later found it being used without permission in an anti-piracy campaign. He is now claiming at least a million euros for the unauthorized distribution of his work on DVDs. To make matters even worse, a board member of a royalty collection agency offered to help the composer to recoup the money, but only if he received 33% of the loot. A story currently unfolding in the Netherlands painfully exposes the double standards and corruption that can be found in some parts of the copyright industry. It all started back in 2006, when the Hollywood-funded anti-piracy group BREIN reportedly asked musician Melchior Rietveldt to compose music for an anti-piracy video. The video in question was to be shown at a local film festival, and under these strict conditions the composer accepted the job. However, according to a report from Pownews the anti-piracy ad was recycled for various other purposes without the composer’s permission. When Rietveldt bought a Harry Potter DVD early 2007, he noticed that the campaign video with his music was on it. And this was no isolated incident. The composer now claims that his work has been used on tens of millions of Dutch DVDs, without him receiving any compensation for it. According to Rietveldt’s financial advisor, the total sum in missed revenue amounts to at least a million euros ($1,300,000). The existence of excellent copyright laws and royalty collecting agencies in the Netherlands should mean that the composer received help and support with this problems, but this couldn’t be further from what actually happened. Soon after he discovered the unauthorized distribution of his music Rietveldt alerted the local music royalty collecting agency Buma/Stemra. The composer demanded compensation, but to his frustration he heard very little from Buma/Stemra and he certainly didn’t receive any royalties. Earlier this year, however, a breakthrough seemed to loom on the horizon when Buma/Stemra board member Jochem Gerrits contacted the composer with an interesting proposal. Gerrits offered to help out the composer in his efforts to get paid for his hard work, but the music boss had a few demands of his own. In order for the deal to work out the composer had to assign the track in question to the music publishing catalogue of the Gerrits, who owns High Fashion Music. In addition to this, the music boss demanded 33% of all the money set to be recouped as a result of his efforts. The conversation between Gerrits and the composer’s financial advisor was recorded by Pownews, and during the conversation the financial advisor confronts Gerrits with his unconventional proposal. “Why do you have to earn money?” he asks, as usually all of the money goes directly to the artists. “It could be because a lot of people in the industry know that they are in trouble when I get involved,” Gerrits responds, adding that he can bring up the topic immediately in a board meeting next week. Once again trying to find confirmation for the proposal, the composer’s advisor later asks if the music boss indeed wants one-third of the money. “Yes, that’s the case, but then [the composer] would make 660,000 euros and now he has nothing,” Gerrits responds calmly. The seemingly corrupt practices of Gerrits resulted in mass disbelief among many Dutch viewers and today the news is being reported by several mainstream outlets in the Netherlands. As a result of the controversy, Gerrits quickly decided to temporarily resign as Buma/Stemra board member to focus on his defense. Responding to the press, Gerrits further claims that he was somehow “misinterpreted,” but unfortunately for him the recordings leave little room for that. BREIN director Tim Kuik, whose organization is accused of distributing the unauthorized copies, noted to TorrentFreak that this is a contractual issue in which BREIN is not involved. Kuik further said that BREIN is not the distributer nor the client in this case. Whatever BREIN’s role in this case, there is little doubt that someone in the movie industry failed to pay the composer. And instead of standing up for the rights of a musician, a board member of the music royalty collection agency tried to exploit the situation for financial gain. Update: Pownews’ written report no longer references BREIN’s involvement in the case. Although BREIN is responsible for many anti-piracy warnings on DVDs in The Netherlands, the video described in this article was made for another party related to the movie industry. This confirms the statement of BREIN director Tim Kuik. 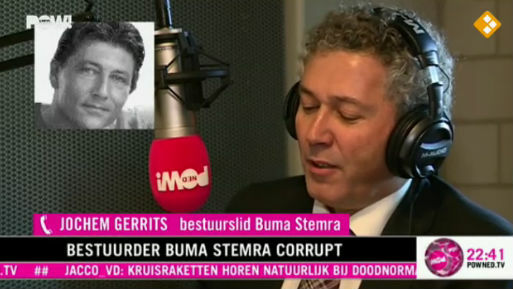 Update: Dutch politicians, musicians and a Buma/Stemra board member are shocked by the revelations and describe Gerrits’ actions as “corrupt,” a “money grab” and “mafia-like.” Politicians want more transparency from the royalty collecting agency, and will debate the issue in parliament.